Flavor Text: "The dead tell me a great many things. Sometimes more than I can bear to hear." 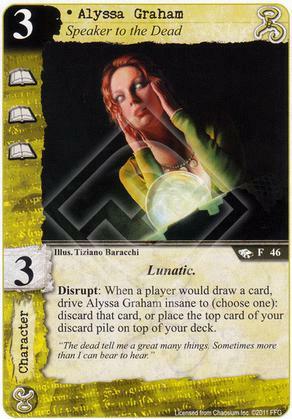 She combines well with Arkham Asylum (Core), which lets her ability to be used more frequently. She can cut the opponent's draws from two down to one, which is enormously powerful. With Byakhee Attack (Core), Implant Fear (SoA), and The Greatest Fear (SoM), can be used to control the enemy hand; and what is more, her ability can be used to keep those cards in recursion. Keeping any card in your hand becomes harder then ever. Arkham Asylum (Core) and whisper would work nicely with all those lunatics. The Parlor (ER) effect happens before Alyssa is triggered.